Deacon Dr. Fresh Wine Newsletter: Happy Birthday Angus! But what wine goes with AC/DC? Happy Birthday Angus! But what wine goes with AC/DC? Yo Ho Ho and a bottle of Shiraz! A few days ago, the World's Greatest Rockstar (according to Kerrang! magazine) just celebrated his 52nd birthday! 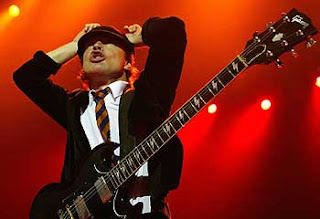 Diminuitive Scottish rock-guitar wizard (and possibly the most important and significant person on earth) Angus Young has been wearing his psychotic schoolboy uniform for over 35 years in the most energetic and kickass live band in the history of the world: Australia's AC/DC! Hello fanz and fanettes of the Deacon and a hearty "Bite my wand!" to all you crackerdine, sheep-dippin', musically moronic Survivor watchers, who think U2 and Bono are somehow "artistically important" and "will save Africa". Thunderstruck - The greatest piece of music ever written! The best wine for it is without a doubt a Daniel Lenko Syrah or Henry of Pelham Baco Noir! Or better yet, drink a bottle of each with the song on endless replay. You'll thank me. Highway to Hell - What can I say about this frickin' song that's not already been said by the Christian Right? The funny thing is, it's nothing to do with Satan or Hell, but is about AC/DC having to tour the US in a bus back in the 1970's before they all became gizzilionaires. The best wine is a really over-the-top Chilean Carmenere, or an overdone California Chardonnay with enough oak to build a summer cottage. Moneytalks - This iconic riff-driven masterpiece needs something ironic. I highly recommend an ice-cold Cave Spring Riesling served in a huge martini glass, or any Jackson Triggs Gewurtztraminer! 6 bottles should do the trick. When you're winding the evening down and need to quiet your brain for sleep, listen to some Black Sabbath accompanied by a couple of bottles of Peninsula Ridge Estate Winery wild yeast Cabernet Franc. Now crank up the volume and get celebratin'! .Angus:When are you and the band(ACDC coming to Canada(Toronto,Sud bury,Ontario next?You guys were awesome in 2003 at Toronto Rocks/Sarsstock? Yeah, and they really rocked at Air Canada Centre in 2000. Watch for Acca Dacca to tour in 2008, and their new DVD comes out on October 16th!